Last week, the Mesalands Community College Rodeo Team had two rodeo competitions at New Mexico State University in Las Cruces, NM and at Cochise College in Douglas, AZ. The Men’s Team took first place in bull riding at both rodeos. They also won a team roping championship title. The Women’s Team brought home the reserve championship title in goat tying. At the New Mexico State University Rodeo, both the Men’s and Women’s Team finished in fourth place. 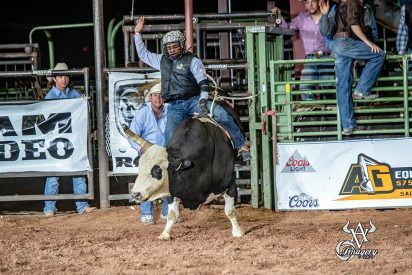 Bull rider Vinell Mariano from Pinedale, NM won the championship title with 74.0 points. Fellow teammate Hiyo Yazzie, from Brimhall, NM placed third in the team roping (heeler), with Erik Becenti from Navajo Technical College. For the Women’s Team, Rebecca Darrup from Mifflinburg, PA was eighth in goat tying with a time of 7.9 seconds. For the Cochise College Rodeo, the Men’s Team was third and the Women’s Team placed fifth. Levi Gray from Dairy, OR brought home the bull riding championship title. Yazzie had another strong rodeo in team roping, winning the championship title with a time of 16.5 seconds. Yazzie also placed sixth in the steer wrestling and finished third in the Men’s All-Around. Delaney Gonzales from Grants, NM had a solid performance at the Cochise College Rodeo. She came in second in the goat tying and was crowned reserve champion at the rodeo. She had a time of 18.8 seconds. In tie-down roping, Chance Wilson from Hope, NM, tied for eighth place. Darrup placed ninth in barrel racing. Kash Pablo from Crownpoint, NM was also ninth in the breakaway roping event. The 11th Annual Mesalands Community College Grand Canyon Region Intercollegiate Fall Rodeo will be on October 12-13, 2018 at the Quay County Rodeo Arena. The first Rodeo Performance is Friday, October 12 at 6 pm. On Saturday, October 13, Slack will begin at 9:00 am (no charge) and the Championship Performance is at 6 pm. Tickets are $5, free for children under the age of 12 (accompanied by a paying adult) and seniors 55 and over are $2. Free admission for Mesalands students, staff, and faculty with a College ID. The Mesalands Community College’s Dinosaur Museum and Natural Sciences Laboratory will be offering free admission for National Fossil Day on October 12-13, 2018. The Dinosaur Museum is open from 12:00-5:00 pm. For more information, please visit mesalands.edu/fallrodeo. Vinell Mariano from Pinedale, NM and a member of the Mesalands Rodeo Team won the championship bull riding title at the New Mexico State University Rodeo. Photo courtesy of Avid Visual Imagery.